Phlox paniculata in all colors and sizes in the summer garden. 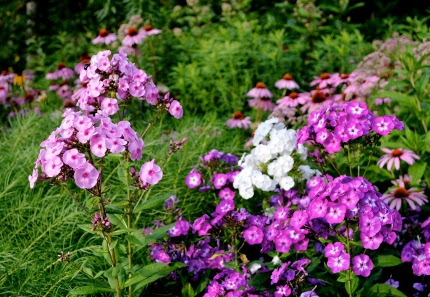 Phlox paniculata- garden phlox is the ultimate summer flower. Big, bold trusses of color that attract butterflies and hummingbirds, smell wonderful, and make great cut flowers. In my garden I have them in rich coral, deep purple, blue, lavender, pink, and lilac. I am planting more. They love a soil with lots of compost and a thick layer of mulch to keep their roots cool. Zinnias- my passion for zinnias grows each year. I use them in the cutting garden on the south side of my house and in my main perennial border, woven in with the phloxes, to create a kaleidoscope of color. You will spot fields of zinnias at every farm stand and buckets of bouquets at farmers markets. 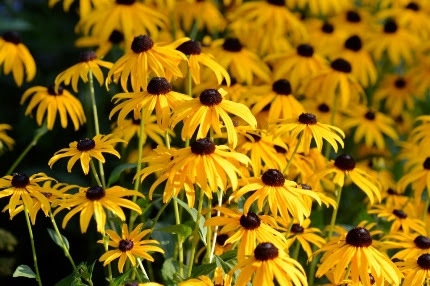 Black-eyed Susans- this is a classic summer flower and it is just so easy to grow in sun or even partial shade. The standard perennial form is Rudbeckia fulgida ‘Goldsturm’ which is native and self sows easily. But there are SO many other species and varieties to choose from. ‘Little Goldstar’ is a dwarf, compact form that I use a lot in garden designs. Rudbeckia subtomentosa ‘Henry Eilers’ is a taller type, with sweet smelling foliage and tubular flower petals. There are July bloomers and varieties that extend the black-eyed Susan season all the way until October. 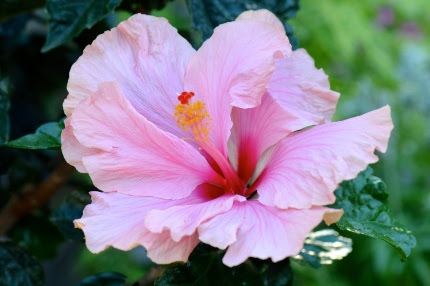 Hibiscus- I use tropical hibiscus plants in many of my summer containers. I have a collection given to me by a fa vorite gardening client that I keep on my winter windowsill and then bring out every summer. August starts the beginning of the perennial hibiscus bloom period. These plants have flowers the size of dinner plates and are one of the most dramatic flowers of the summer border. Rose of Sharon trees are a hardy, woody form of Hibiscus. Called “the last rose of summer”, they are not a rose at all but they sure are pretty in bloom wherever I go. Mine are a favorite nectar plant for hummingbirds. We would love to know what says summer to YOU! Join the conversation on the Natureworks Facebook Page and share photos of your summer garden with us.